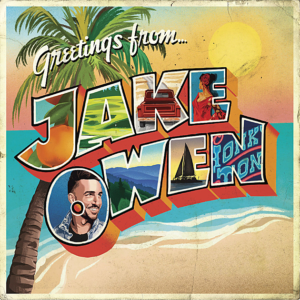 “Greetings From…Jake” is Jake Owen’s sixth studio album, and his first since he signed for Big Loud Records. Any concerns that the change of label might bring a change of style can be quickly laid to rest. Where past releases have seen him dabble with a poppier sound and feature a horn section and synths, with mixed results, Jake’s latest album will sound less challenging to many. That’s not to say it’s a retread of previous work, or a retreat into more familiar sonic territory. No, it’s definitely a contemporary album; an album that’s happy to meld traditional country instrumentation and lyrical imagery to modern production and arrangement. Jake has a solid reputation for delivering songs with a sunny beach feel to them, and the new album doesn’t disappoint on that score. It even begins before you hear a note, with the sleeve design based on a traditional holiday postcard style. That in itself is a little odd, since more than a few of his fans won’t have any experience of writing (Yes, actual writing! With a pen!) on a card a short note to friends and family at home to let them know what a great time you’re having on your vacation, and sending it via the mail. It’s a tradition that predates the Internet and the ubiquitous Social Media, and it’s probably all but died out now. So the cover design may connect on different levels with different fans. That said, the way it’s done leaves no doubt that this album will have you feeling summery and pining for that trip to the beach that’s maybe still a few months away. If you’re looking for songs with social or political comment to make, then you’re very definitely in the wrong place. Just sit back and enjoy this album for what it is. So then, to the music. Having set the idea of this as an easy, breezy experience, Jake just casually saunters in with “Down To The Honkytonk” as the album’s opener. You’re probably already familiar with this song as it was a Top 10 single last year. If you’re not, then the basic premise of the song is about living the life you have, even if you’re not “living the dream”, so to speak. Shane McAnally co-wrote the song, you can hear his influence in the lyric, and it’s such a catchy thing. It’s got great tempo, an easy going groove, Jake’s vocals are spot-on, and it’s a terrific opener. If this song doesn’t bring a smile to your face and a tap to your toes, then I don’t know what will. Owen keeps the good time going with “Ain’t Here To Talk”, about a woman in bar looking for a dance, and “Catch A Cold One”, full of sage advice passed on from his grandfather. All of these first three songs have a sense of nostalgia and looking back, whether it be in terms of their sound or in the story in the lyric, but they’re neither old-fashioned nor deliberately “retro” – far from it, in fact. They’re just well written, well produced, well performed songs that are without question identifiable as good time country music. Indeed, nostalgia runs strongly throughout the album but it’s done in a manner that celebrates the foundations of the songs and of the artist himself. In so doing, Owen manages to avoid the “It was better in the old days” trap. “I Was Jack (You Were Diane)” takes the well-known guitar line from John Mellencamp’s seminal 1982 hit and embeds it into a song looking back fondly to a teenage friendship that the song “Jack & Diane” always takes him back to – could’ve been more than friendship, the lyrics leave it open, but for sure it’s a boy and a girl. Jake speaks, rather than sings, the verses – something he’s no stranger to. I generally tend to think this is a bit of a gamble. Spoken passages can sometimes seem like a good idea but can risk sounding a little clunky, a little awkward, with an artist used to singing having to find a different method to express the lyric while still fitting into the rhythm of the melody. I think it just about works here, the lyric and melody are just about strong enough to support it. “But I hope like hell every now and again, I blow across your mind like that summer wind, And you’re holding on to sixteen as long as you can, Every time that it comes on.” Mellencamp’s original is such a part of the new song, he’s been given a co-write credit. It was a number 1 single last year, so I imagine he’s pretty happy about that. The first of two collaborations on the album is next, with Kid Rock guesting on “Grass Is Always Greener”. They make a good pairing on this buddy duet, which is another advisory to just chill and be content with your lot. Just because he has a certified “rock star” helping him out on this track, don’t assume it’s any heavier or harder. No, the laid back, chill out attitude just keeps coming. As if to emphasise that, in this song the “Grass is always greener in somebody else’s joint” – it’s a witty twist on a familiar phrase. It’s followed by “Homemade”, another song looking back – this time at the values instilled at home during early years that have gone on to shape the man he is today. “There’s some things about me that I can’t change, I’ll always be the man that home made”. It’s another celebratory song, with an anthemic sing-along chorus. “You can’t drink all day, if you don’t start in the morning”. When you put it like that, it’s pretty obvious. It’s maybe less obvious to make such a catchy number out of that pearl of wisdom, but that’s what Jake has done with “Drink All Day”. It’s all sunshine coastal imagery, syncopated rhythm and a lilting arrangement to match. “That’s On Me” sees Jake spending an evening of quality time alone with his lady. Many songs with this kind of theme can get a little bit tacky, but this one avoids it. Perhaps having a woman on the writing team, in this case Laura Veltz, helps to steer clear of the macho excess. The result is a lyric and a tone that’s sultry and suggestive but only goes so far down that road, preferring instead to paint a picture of love rather than lust. And it’s a very good song. The second duet on the album, “Señorita”, is a latin influenced number featuring Lele Pons. Basically, it’s a tale of a holiday romance in some exotic paradise location. Spanish guitars and conga’s help to create the latin vibe. I’ll confess, I have no idea who Lele Pons is other than she’s Venezuelan and a “YouTube sensation”, but she does a good enough job with her part. “In It” is a real change of tone, what you might call an old fashioned ballad, a pedal steel soaked “She’s leaving me” story. Except in this tale, the parting seems to be amicable, despite the sense of loss. Jake’s baritone stays at the bottom end of it’s range and, what with that and the slower pace of the song, he gets the right level of emotion across. “River Of Time” is quite a simple song with another very catchy sing-along chorus. Reflections on mortality and the passing of time aren’t usually as light and sunny as this, but this is Jake Owen’s take on the subject so light and sunny is what we get. For me, I wouldn’t miss this track if it were to suddenly disappear, it’s just a little too light for my liking. “Made For You”, on the other hand, is a stone cold classic; another ballad but this time a declaration of love. “Tiny shoes are made for tiny feet, And my two arms are made for where you sleep, And the sky was made for the moon and stars, And you were made to steal my heart, And I was made for you”. It’s sweet without being sickly, romantic but not twee, and because it’s Jake Owen you feel like it’s happening around a driftwood fire on a quiet beach on some idylic island somewhere. Credit where it’s due for the production on this track too; it could easily have gone into power ballad territory as the arrangement builds, but they manage to keep it in check and the song greatly benefits from that. I like songs that take me somewhere else, somewhere “better” than where I am at the time. On “Mexico In Our Minds” Jake and his lady are sitting at home in Tennessee, watching the sunset – it already sounds great to me. But where they really want to be is on a beach in Mexico, so they pretend, with lines like. “Actin’ like this Bud Light is a Corona and lime, And this green grass is that sand so white”, and “We’ll pretend that when them trucks go by, That’s just the sound of that rollin’ tide”. There’s a suitably dreamy, echo laden pedal steel and dobro arrangement underpinning this mid-tempo number, and Jake’s vocal is just a little bit more relaxed than usual as if to emphasise the fantasy element. The album winds up with “Damn”, a song that Jake’s had rattling around for the last 10 years or so. I’ve no idea why he hasn’t recorded it before now, it’s certainly not a filler track. It’s a little rockier than the rest of the album, but only a little, and isn’t out of place. “Greetings From….Jake” is a very welcome return. 14 songs on the album, most are around the 3 minute mark, nothing outstays its welcome. It has some great singles already released from it, and I’ll be interested to see if any more tracks become singles as there are definitely some contenders. You never get the sense that he’s taking things too seriously and he usually sounds like he’s singing with a nod and a wink and a cheeky smile, but he never goes so far as to tip over into parody or novelty act. It’s a perfect time to release the album as the days are lengthening and the weather is warming up. I can’t remember the last time I heard an album with so much sunshine in it. If you’re going to listen to it, take my advice – remember to drink plenty of fluids, and you’re probably going to want to have some factor 30 sun cream handy.